We all know I’ve been waiting years for the Ribby Cardi, and I even swatched already, so I cast on and left it in the “yarn room” by my DVD watching chair. It’s on a cone so I don’t anticipate taking it anywhere. Instead I’ve surrounded it with all my knitting accoutrements and left it in a convenient place to grab while I’m watching Bones on DVD. Of course that wasn’t enough so on Saturday I headed over to the bead store, bought some beads, and started Ice Queen. Ok, not that impressive yet, and I haven’t even started the beading. But a provisional cast on of 156 stitches! I haven’t worked with Kidsilk Haze before, and I’m not sure I’m a fan – I actually really don’t like silk but it belonged to a friend who is allergic to mohair and was up for grabs. I figured I could use it to knit something for a gift and I had just seen the Ice Queen pattern… But it’s kind of like knitting with fuzzy dental floss. Of course, when starting lots of new projects it’s important to finish older ones to free up needles. This is a nice relatively mindless textured pattern. The texture is much more visible in real life than in the picture. 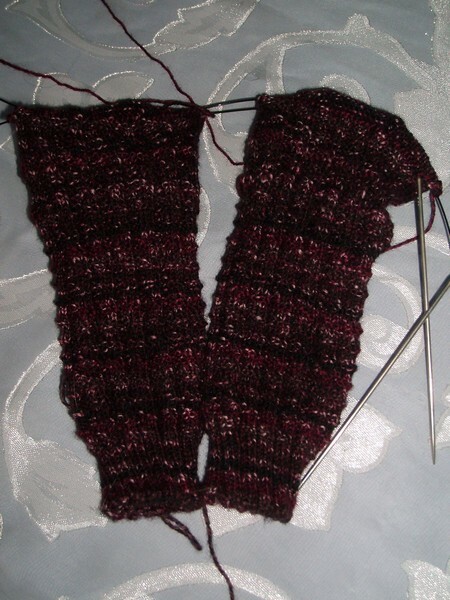 I modified the pattern for a 72 st cast on and no calf shaping (because of the shorter cuff) for a woman’s L size. So if I were sane that would be the end of it, but I’m not so I went on a mission into the garage to try to find that Christmas stocking I was knitting for my mom last year and finish it. The mission was unsuccessful – unfortunately I think I put it “somewhere safe”. I have a tendency to do that with things and then forget where that safe place was. In fact, during the search for the stocking I found some great cherry print fabric I bought to make a sundress with and put “somewhere safe” over a year ago – I’ve been looking for it ever since. But I think you’ve had enough for one night so we’ll talk about the rest of my new projects another day. Thanks everyone for the scarf suggestions. It got me thinking and looking, and I decided on one which no one mentioned. It is, however, in Scarf Style which Toby mentioned. That got me looking through the book where I found the Here and There Cables (Ravelry link) scarf. It’s just what I was looking for – something with a lot of textural interest that is also reversible. I might take out one repeat and make the scarf a narrower, though. 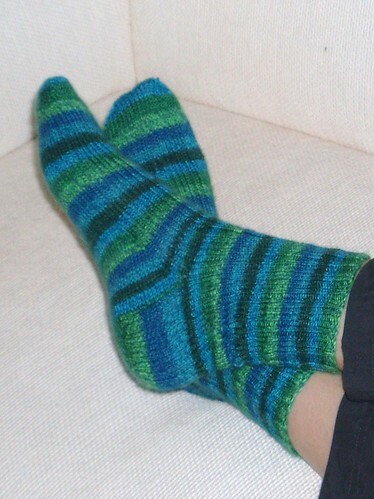 Patterns like Monkey and Jaywalker are probably so popular for just this reason – they’re relatively easy to knit, but produce nice non-boring socks. 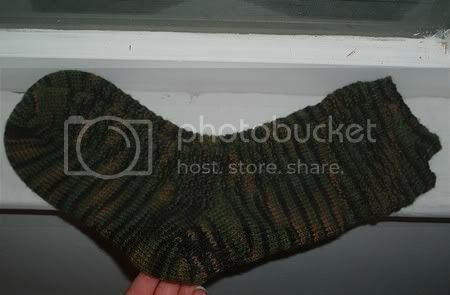 My current one is a modified version of the Gentleman’s Shooting Stockings from Knitting Vintage Socks. It’s a simple textured pattern, but it adds some interest to this yarn. Although if I had known originally that the yarn was stripey, I might have done something a little less fancy. In any case, I think they’re turning out well. 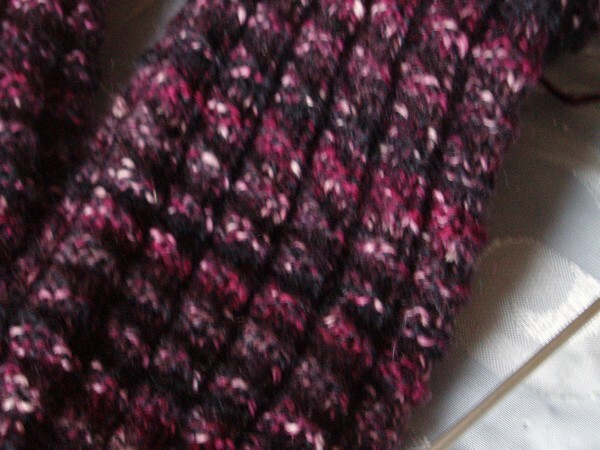 The closeup of the stitch pattern is a little blurry, sadly winter light isn’t great for taking photos. 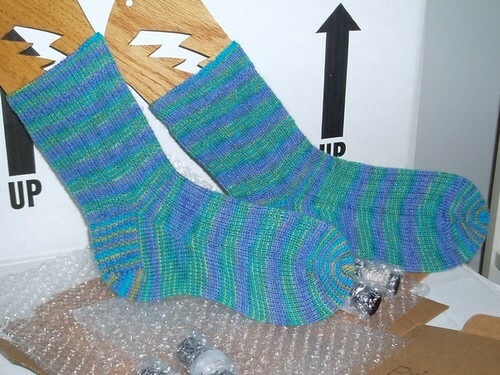 And thanks to Cindiluhu and Chris for validating my sock-knitterness. The truth is that I want to knit other things. 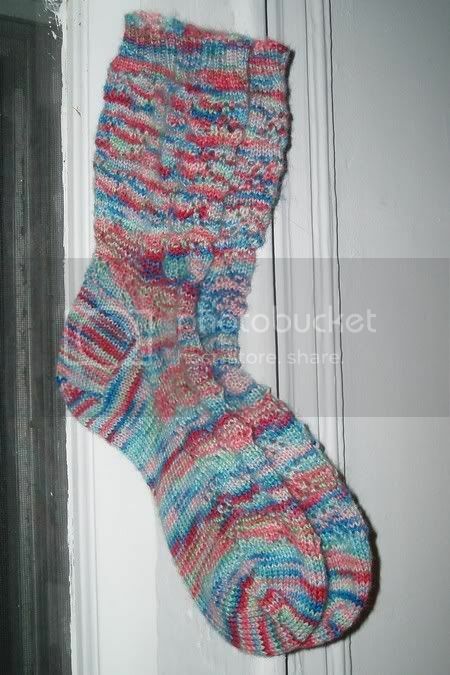 I’m not planning on stopping the sock knitting – not even close! But I do want to knit a few things that aren’t socks. And the actual process of knitting a sock vs. a sweater doesn’t make that much of a difference to me. The problem is more that when I go to cast on a new project I don’t grab the yarn for that sweater I want to knit, I grab more sock yarn. (There’s a lot of it, it’s in exciting colors, I don’t have to swatch!) 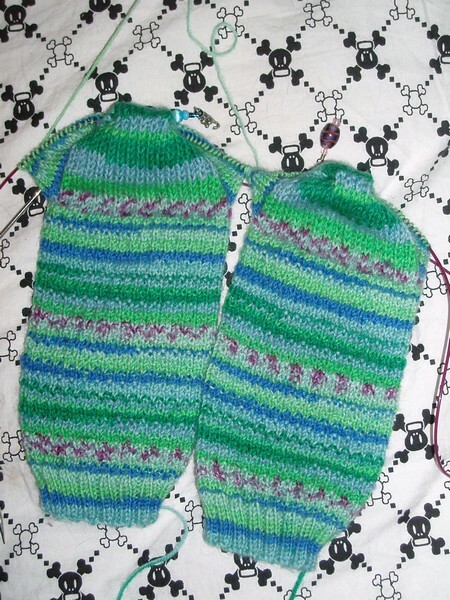 But I *do* want a Ribby Cardi and a new scarf, so I should really get to knitting them. I’m on the wrong side of the country for Rhinebeck this year, and it’s sad. It’s the first year I haven’t gone to Rhinebeck since the first time I did. And then I didn’t make a Rhinebeck sweater, either! But I hope all my yarny friends are enjoying Rhinebeck anyway. Lately it seems like I want to knit simple things while watching Netflix. So I’m powering through the simple socks and leaving the less simple ones to languish. Maybe it’s a lesson I need to learn about myself, or maybe I need to catch up on podcasts and knit some of the more complicated ones! I finished a pair of socks, finally! 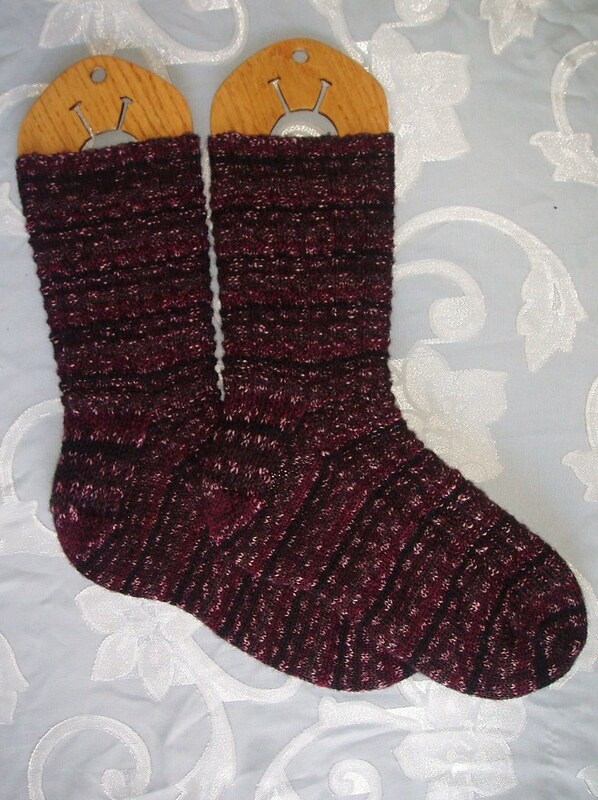 I’m still working on my goal of knitting all the socks from Knitting Vintage Socks, but from the start I decided that modified versions were fine since I have very few males to knit socks for. This is one of those cases – I took the Ringwood stitch pattern and plugged it into a pair of socks that is me-sized. The yarn is one that I bought on my trip to Seattle for sock camp and also a new one for me. While I was knitting I got a lot of comments on these socks – the color combination really is gorgeous! The yarn itself is a fairly standard wool/nylon blend, and it’s a bit scratchy compared to the 100% merino hand dyed yarns I’ve been working with lately. 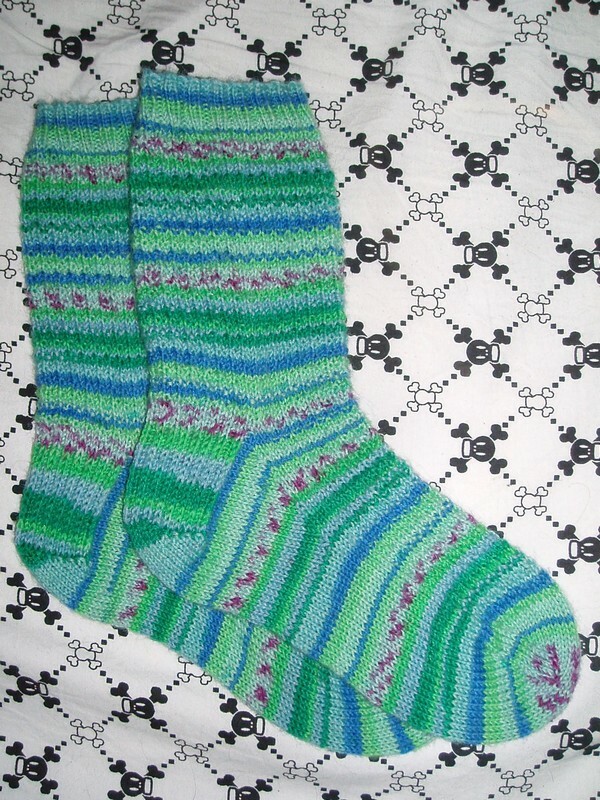 But – like the Noro socks – I think it will be perfectly comfortable on the feet and almost certainly hold up very well. What? It’s the end of the year? Right! Well, I was just talking to Catherine about knitting resolutions for next year. This year I didn’t really start with any resolutions. I did pledge to try to buy only 1/3 of the yarn I used. I didn’t completely succeed with that, but I did use more yarn than I bought this year, which I think is pretty good. In April I decided to knit all of the socks from Knitting Vintage Socks , which I’m still working on. But I never said I would do it this year, and it hasn’t been a year since April quite yet anyway. So what about knitting goals for 2008? Well I do want to continue working to get the stash under control. I also would like to work on trying more of the different types of yarn that I have in the stash. 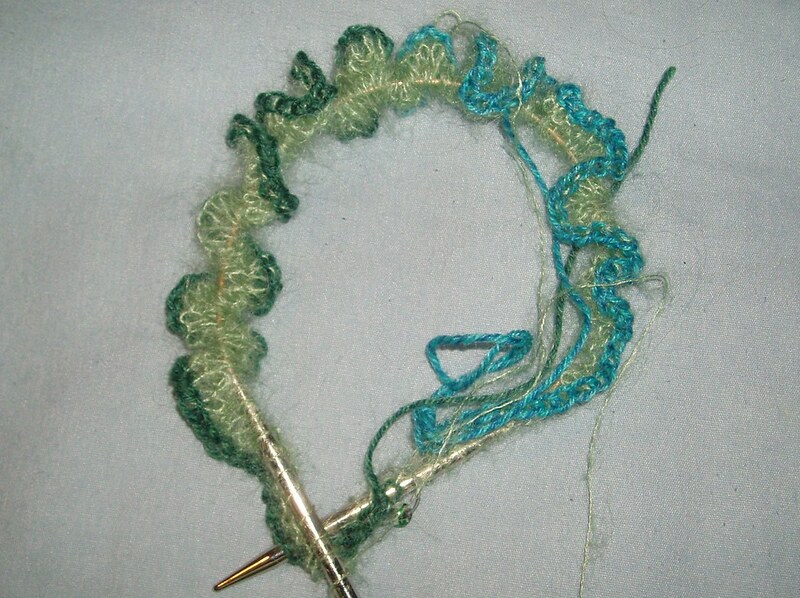 As much as I want to try new yarns, I tend to knit with the same ones over and over. I also want to knit a sweater in 2008. Maybe start my Rhinebeck sweater a little more than two weeks ahead of time. 😉 I have yarn for a couple of sweaters that I’ve been thinking about knitting for a good while but haven’t actually started yet – the two foremost in my mind being the Ribby Cardi and this Adrienne Vittadini sweater. Well, that and Durrow. 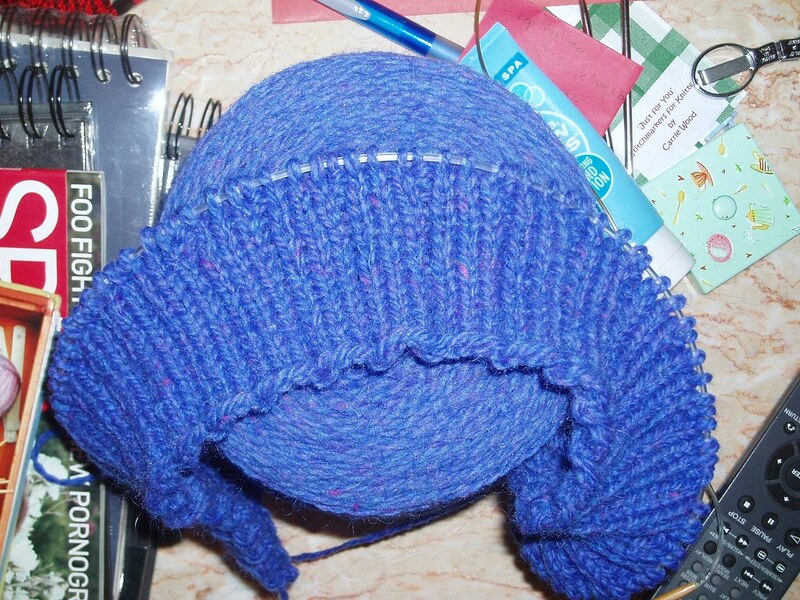 Now back to the grindstone – I’ll keep brainstorming about knitting goals for the new year.